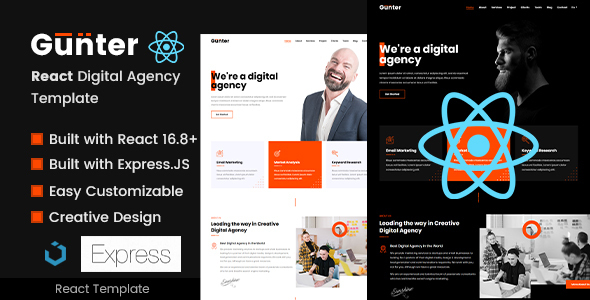 Gunter React is a Creative Modern and Beautifully Stunning Responsive Template for Digital Agency Business! This template is offering multiple variations in landing page homepage design with unique User Experience (UX) and Look & Feel. It looks stunning on all types of screens and devices. The template has been built on React, Express.js, UIkit (v3.x) and Lax JS. The Gunter React is also offering multipurpose features which can be used to present and promote Online Marketing or Digital Business, Startups, SaaS applications, Software, Digital products, Books or magazines website, Online Resume, Portfolio, Business offerings, etc. Gunter offers a creative and business-focused way to present and promote your initiatives on the web. Please send us email to [email protected] with your details query. Thanks!